Welcome to beautiful Sandbridge Beach - a unique coastal community in Southern Virginia Beach. Experience the best of both worlds - where the beach meets the bay and offers a true reprieve from the hustle and bustle of everyday life. 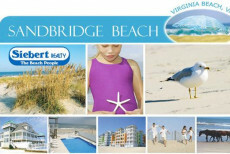 Siebert Realty offers over 360 fully furnished Virginia Beach vacation rentals located in the exclusive Sandbridge Beach area. These beach home and condo vacation rentals come fully equipped with all the comforts of home.